Once you’ve gone 120Hz-plus, you won’t want to go back to 60Hz. Of course, you need a beefy and thus expensive graphics card to make the most of the refresh capability. Picture the perfect gaming monitor. Optimized for speed and response, but also practical for daily computing. Not some mega-money trinket with features you’ll never use, but a screen that hits the sweet spot where it matters. You might imagine a 35-inch panel, with a super-wide 21:9 aspect, a gentle curve, high refresh, and some kind of variable refresh tech. You may also split the difference between maximizing pixel density for productivity and putting a cap on pixel count to maintain that crucial frame rate. In that case you would end up with something that looks a lot like AOC’s Agon AG352UCG6. AOC was once known as a purveyor of poverty-spec LCD panels. OK, with Philips as its corporate sibling, it has long has access to big-brand clout, but you wouldn’t exactly have called AOC aspirational. That was then. Now, AOC’s Agon sub-brand is taking the fight to the likes of Asus’s ROG products and Acer’s Predator panels. Consequently, the AG352UCG6 nails it when it comes to on-paper capabilities. 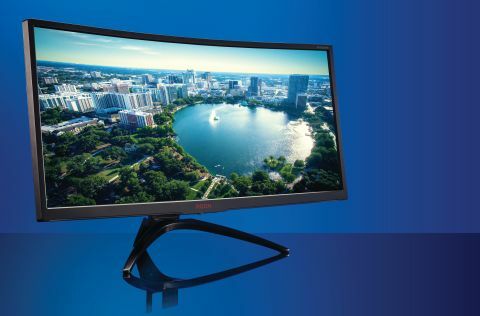 At its core is a 35-inch panel packing 3440x1440 pixels, courtesy of a 21:9 aspect ratio. That places it an inch larger than the 34-inch form factor that popularized that particular pixel grid. It’s also unusual in leveraging MVA rather than IPS panel tech. MVA tends to be strong on contrast and color saturation, but weaker on viewing angles and response. The latter is intriguing in the context of this panel’s gaming-centric credentials. First up, it supports up to 120Hz refresh. To make the most of that speedy update and guarantee the slickest response possible, AOC has also configured Nvidia’s G-Sync tech. Elsewhere, the premium feature set is rounded out by a robust and fully adjustable stand, save for pivot, which is a forgivable omission in a large wide-aspect display. Oh, and the chassis includes rear-firing and programmable mood lighting. First impressions upon firing up don’t disappoint either. This panel has a pleasing overall appearance. In fact, it has the subtle feel of an IPS panel, rather than the in-your-face saturation that often signifies VA tech. That said, black levels and contrast are strong points, which is more in line with the typical VA narrative. On the downside, viewing angles aren't great. In images used to reveal off-center color deviation, this panel can’t compete with IPS for image stability when viewed at acute angles. Likewise, when it comes to punch and vibrancy, this AOC is nowhere near the latest HDR or quantum dot monitors. Another minor niggle involves the 120Hz refresh. By default, the screen only supports 100Hz. Enabling 120Hz requires a trip into the OSD menu to switch on so-called “overclocking.” This menu is controlled by a single joystick on the bottom of the lower screen bezel, and is very confusing to use. More importantly, it’s silly to have to enable overclocking to access what is advertised as a core feature. Presumably, AOC thinks overclocking is cool. Which is fine. But it should be reserved for modes that fall outside the standard specification. That said, in testing, the 120Hz capability and its G-Sync sidekick work flawlessly. Once you’ve gone 120Hz-plus, you won’t want to go back to 60Hz. Of course, you need a beefy and thus expensive graphics card to make the most of the refresh capability. The panel’s 3440x1440 native might not be as demanding as full 4K, but it’s still an awful lot of pixels (4,953,600, to be precise) to push 120 times a second.